Gum Disease Therapy in Brampton. Contact us today for an appointment! 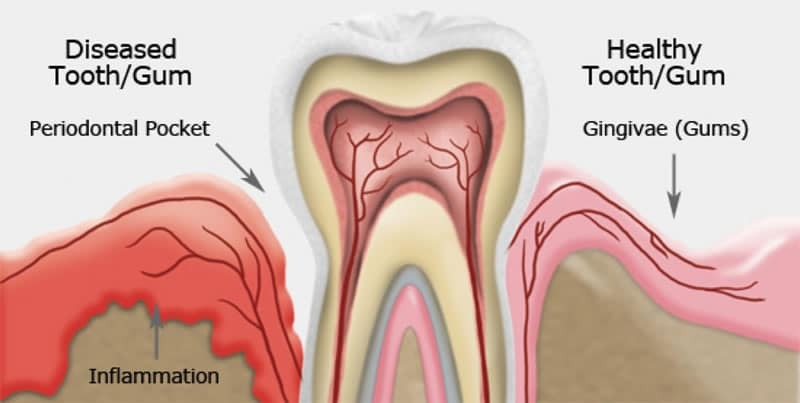 Gum disease, also known as periodontal disease, is inflammation of the gums as a result of plaque build-up on the teeth and under the gum line. It ranges in severity from a reversible minor inflammation of the gums to major damage to the bones and soft tissues that support the teeth if left untreated. Gum disease is one of the main causes for tooth loss in adults. Symptoms are often not noticeable to patients until the disease is in the advanced stages. Fortunately, our trusted Brampton Dentist and experienced dental hygienists can diagnose gum disease and provide appropriate treatment even at its earliest stages. The earlier stage of gum disease, called gingivitis, can be treated with a good professional dental cleaning, where plaque build-up is removed from your teeth. The more advanced stage of gum disease, called periodontitis, requires a more vigorous routine of professional dental cleaning to get rid of the hardened tartar and plaque that go beyond the visible tooth surface, all the way to the tooth root, deep under the gum line. Good oral hygiene is essential. Excellent oral hygiene routines at home and regular dental check-ups and professional cleanings are vital to improving your gum health and reducing your risk of developing gum disease.